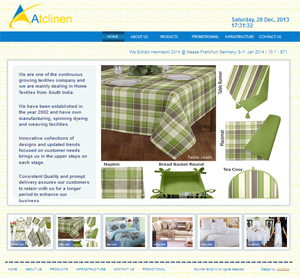 A textile company in Karur Producing Bed Linen, Kitchen and Restaurant Linen, Table Linens etc and Exports to all over the country. "We are one of the continuous growing textiles company and we are mainly dealing in Home Textiles from South India. We have been established in the year 2002 and have own manufacturing, spinning dyeing and weaving facilities. Innovative collections of designs and updated trends focused on customer needs brings us in the upper steps on each stage."